Professor Egmont Rohwer, who heads the University of Pretoria’s (UP) Mass Spectrometry and Chromatography Laboratory in the Department of Chemistry, was recently awarded the prestigious Georg Forster award of the Alexander von Humboldt Foundation in Germany. Every year, the Foundation enables more than 2 000 researchers from all over the world to spend time researching in Germany. It maintains a network of more than 29 000 Humboldtians from all disciplines in more than 140 countries worldwide – including 55 Nobel Prize winners. The Georg Forster Award honours researchers from developing and transition countries who have earned international recognition for their research work and aim to solve development-related issues. Award winners are nominated by specialist colleagues from Germany and are invited to establish or expand co-operation with them. Prof Rohwer, former head of UP’s Department of Chemistry, has been given a research award for cooperation with specialist colleagues at the University of Rostock and the Helmholtz Zentrum Munich – German Research Centre for Environmental Health. 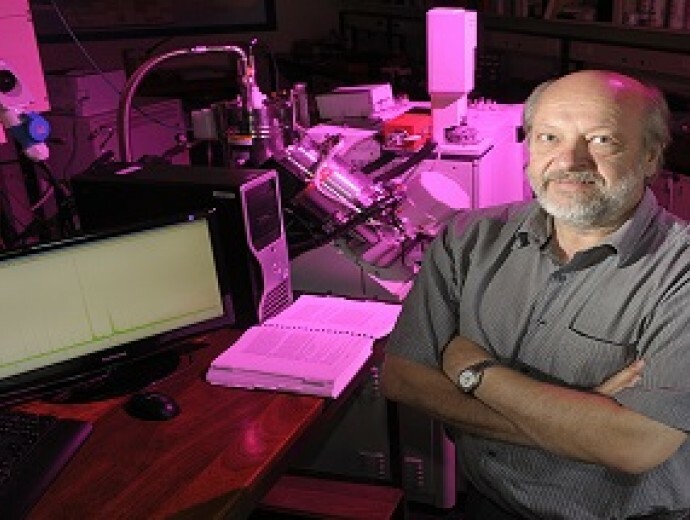 Prof Rohwer’s research at UP since 1983 focuses on chromatography and mass spectrometry in order to establish the chemical composition of complex mixtures. “This is done to address research problems in fields ranging from engineering, biology, geology and archaeology to forensic, environmental, medical and food sciences, ” he explained. A project presently led by Prof Emil Roduner and Dr Shankara Radhakrishnan that aims to convert sunlight and carbon dioxide to liquid fuels was initiated by Prof Rohwer six years ago. He was introduced to mass spectrometry during his early training in physical chemistry, studying the kinetic energy release of ions fragmenting in the field free regions of a double focusing mass spectrometer. The fundamental approach required for such studies remains the hallmark of his subsequent career in analytical chemistry, with specialisation in chromatography and mass spectrometry, first in industry and since 1983 in academia. As an academic driven by a childlike curiosity as well as a desire to contribute to the development of society in his native country and continent, Prof Rohwer dedicated his research to projects that combine innovative new methods for tackling the global “grand challenges” of education, job creation, health, environment, safety and security as well as sustainable energy, food and water resources. In hindsight, Prof Rohwer considers himself “one of the luckiest researchers in the world” for having been in a position to make useful contributions on widely differing themes including health (malaria eradication, tuberculosis diagnosis, endocrine disruptors, occupational health of mineworkers), energy (synthetic fuels from coal and gas via the Fischer-Tropsch process, and synthetic fuels with no carbon footprint from renewable solar energy), food and beverages (novel aroma assessment methods that allow investigation of the human smell sensation when bouquets of compounds rather than single compounds are perceived), as well as environmental pollution assessment (persistent organic pollutants like dioxins and DDT, endocrine disruptors, detection and the fate of anti-retroviral pharmaceuticals in open fresh water sources). His present projects include the analysis of insect pheromones and human skin volatiles with in-house developed sampling technology and state-of-the-art chromatography and mass spectrometry instrumentation. The aim of this work is to search for combinations of compounds that are attractive to agricultural pests and mosquitoes, to be used as baits for monitoring and control purposes. Patterns of skin-volatiles (metabolic profiles) are also searched that are associated with specific illnesses, for future non-invasive and point-of-care diagnosis of malaria and tuberculosis. His Mass Spectrometry and Chromatography Laboratory was supported by SASOL as a strategic national asset for many years. He has 95 publications in international specialist journals and holds a number of patents. He has been the main supervisor of 27 Master of Science students and 15 PhD graduates. Prof Rohwer spent two years at the Technical University of Munich as a Humboldt stipendiate and twice received the UP Exceptional Academic Achiever award. He has a B2 rating from the National Research Foundation, in recognition of his high-quality research outputs. Prof Rohwer invited “the bright young minds entering university to consider science as a career, trusting it will also provide them with the challenges as well as meaning they need for their lives”. You can view all the recent staff awards here.